Dhaka, Oct 22 (IANS) India on Sunday said that Myanmar should take back the thousands of Rohingyas who have fled to Bangladesh following a military crackdown in Myanmar’s Rakhine state. “India is deeply concerned at the spate of violence in Rakhine state of Myanmar,” Indian External Affairs Minister Sushma Swaraj said in a joint address to the media along with her Bangladeshi counterpart Abul Hassan Mahmood Ali following the fourth India-Bangladesh Joint Consultative Committee meeting here. “We have urged the situation be handled with restraint, keeping in mind the people’s welfare,” Sushma Swaraj said. Without naming the Rohingyas, she said it was clear that “normalcy will be restored only with the return of the displaced persons to Rakhine state”. According to the latest figures issued by the UN office in Bangladesh, over 600,000 refugees have entered the country since August 25 after the Myanmarese Army’s crackdown on the minority Rohingya community following a series of attacks on security personnel in Rakhine. “In our view, the only long-term solution to the situation in Rakhine is rapid socio-economic and infrastructure development that will have a positive impact on all the communities living in the state,” Sushma Swaraj said. The Commission, led by former UN Secretary General Kofi Annan, submitted the report with 88 recommendations to deal with the sectarian violence and foster development in the region. During Indian Prime Minister Narendra Modi’s first ever bilateral visit to Myanmar last month, India too offered to help in the economic development of Rakhine state. Since the middle of last month, India has, through its ‘Operation Insaniyat’, supplied essential commodities like parboiled rice, dal, salt, sugar, cooking oil, tea, milk powder, mosquito nets and soap to the displaced Rohingyas in Cox’s Bazar district of Bangladesh. There are around 40,000 Rohingya refugees in India too, but New Delhi has made it clear it was not willing to accept them because of security concerns. 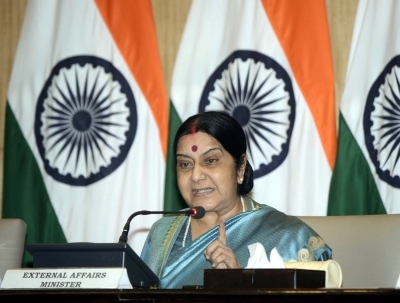 In her address to the media here, Sushma Swaraj also mentioned that India has extended three lines of credit to Bangladesh amounting to $8 billion, the largest developmental assistance India has extended to any country. “In addition, India has also been extending grants for small socio-economic projects in Bangladesh,” the Indian Minister said. Sushma Swaraj also referred to the cooperation between India and Bangladesh in the energy sector and said that India was now supplying 660 MW of “much-needed power to the Bangladesh people and this figure will double, if not triple, in the foreseeable future”. “We will work together as founding members of the (India-initiated) International Solar Alliance, for which Bangladesh has just confirmed its accession,” she said. “This alliance is expected to make solar energy affordable by aggregating demand, promoting universal access to energy, and networking research and development.